Handheld shower heads have flexible hoses which makes it easy to manipulate and reach all the areas you need. I even use mine to rinse out the bathtub after cleaning it! You can use a handheld shower head for multiple purposes. It’s a perfect solution for anyone who cannot stand by themselves in the shower because of injury. It is also ideal for baby baths! 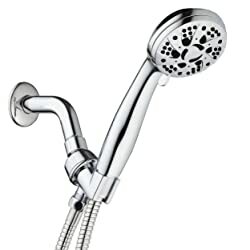 There are many handheld shower heads to choose from and each one has its own unique features. We have provided reviews of our top 12 picks below. Hopefully, you will find one that interests you. You can use this AquaDance shower head as either an overhead or handheld shower. It has a high-power 3.5-inch click lever dial to switch between six different spray settings. The ergonomic grip handle is ideal for elderly individuals who have a weaker grip. When using this shower head as an overhead shower, you can use the angled bracket to adjust the position of the water spray. The reinforced stainless steel hose is 5-feet long to give you more flexibility with rinsing. This AquaDance product is easy to install and requires no tools. It fits any standard shower arm so you can use it to replace your existing shower head. An additional feature of this shower head is It has a water saving pause mode which will temporarily stop water flow. This is a great option for RVs or even for baby baths. The AquaDance 6-setting shower head comes with a limited lifetime warranty. It is a risk-free choice for your shower head needs! The AquaDance 3328 overhead shower head has a large 7-inch face which gives you a drenching rainfall water flow. It is angle-adjustable to give you perfect water spray positioning while you shower. The corresponding handheld shower has a large 4-inch face that can be used as an overhead or handheld shower. Both shower heads have rub-clean jets for easy cleaning and to prevent lime buildup. Each shower has six settings which includes a water saving pause mode. This shower has a patented 3-way water diverter to direct water flow between the two shower heads. The handheld shower includes a 5-foot stainless steel hose for flexibility while rinsing. This combination shower head is easy to install and requires no tools. It will fit any standard shower arm and comes with a lifetime limited warranty on defective parts. YOO.MEE has designed this shower head for high water pressure. It has silicone rubber jet nozzles to prevent mineral buildup. The shower head body and bracket mount are made from durable ABS (acrylonitrile butadiene styrene) plastic. The 79-inch stainless steel hose has solid brass connection fittings that will not crack or split. This shower head has three spray settings and is easy to install. It comes with everything needed for installation and there are no tools required. This is a budget-friendly choice for your shower head needs. The Hydroluxe 1433 is a dual two-in-one shower head system. 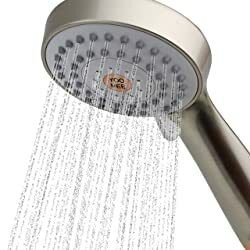 This product includes an overhead rain shower head and a handheld shower head. Each shower head features a 4-inch wide face and has five different water sprays. 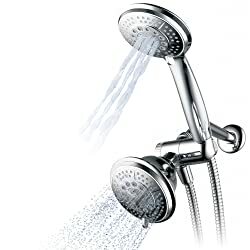 These two shower heads can be used individually or you can turn them both on and use them at the same time. This gives you 24 different setting combinations for you to enjoy during your shower! There is an angle-adjustable overhead bracket that allows you to position the overhead shower for the best water coverage. This shower head is easy to install and requires no tools. It will connect to any standard shower arm. If you are looking for the ultimate in shower pampering, consider this Hydroluxe combination shower head. The limited 10-year warranty makes this a risk-free choice! This Luxsego ionic shower head uses special mineral stones to create a double filter system. The stones reduce chlorine and absorb harmful substances while purifying the water before it hits your skin. The shower head has three different spray patterns and comes with a 57-inch hose. This shower head fits a standard size shower arm and requires no tools to install. You should replace the mineral beads every 6-8 weeks for best performance and filtering. This is a two-in-one shower head combination kit which includes an overhead shower and a handheld shower. Both shower heads have a large 4-inch face and a click lever dial for changing water spray settings. The handheld shower head has an ergonomic grip handle making it easier to hold when wet. Rub-clean jets make it easy to hand clean both shower heads to prevent mold and lime buildup. The spot-resistant chrome finish is easy to wipe off after use. If you are looking for a new way to pamper yourself in the shower, consider this two-in-one shower head kit. You will not be disappointed in the results! This handheld shower heads has one of the easiest docking systems available. The magnetic docking system attaches to the shower arm allowing you to use the shower head as an overhead or a handheld shower. When you return the shower head to the magnetic dock, you will hear a distinctive snap that lets you know the shower head is in place.. This shower head has a 3.5-inch face. It has a simple turn dial which offers six different water spray patterns. The 59-inch hose gives you flexibility to use the handheld even when sitting down in the shower. Moen offers an unmatched lifetime warranty in case anything goes wrong with your product. This Magnetix Moen shower head is a risk-free option for you to try in your bathroom remodel or new construction project! 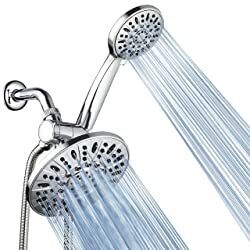 This shower head works really well in lower water pressure systems. YOO.MEE designed this shower head to provide high pressure even when low pressure is present. This makes it an ideal solution for well water systems. Hand clean the rubber jet nozzles to prevent mold and lime buildup. 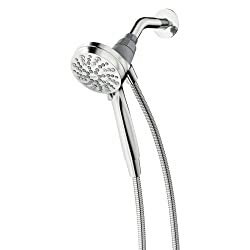 The handheld shower head has a 79-inch stainless steel hose which is longer than most handhelds. Although the parts are ABS plastic, the handheld shower head still provides a lot of function. It has an easy dial allowing you to switch between one of three water spray settings. The YOO.MEE brushed nickel shower head comes with everything needed for installation. You do not even need tools to install this shower head. 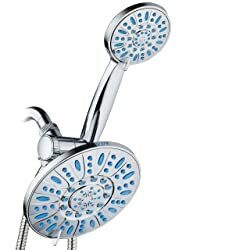 This is a great choice for your shower head needs. 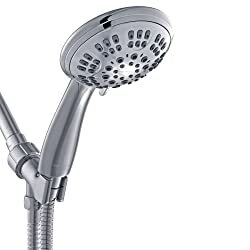 Besides the oil-rubbed bronze finish, this handheld shower head includes features we did not find on any other handheld shower heads we reviewed. This shower head has a bracket holder that is made from solid brass. Many other shower heads come with plastic or chrome brackets. The hose on this handheld is a 63-inch stainless steel hose that can stretch up to 75-inches. The large 4.5-inch shower head has a turn dial with six available water spray settings. You will need a simple wrench to install this shower head, but they provide the tool in this kit. This product comes with a full 10-year warranty if purchased directly from the manufacturer. This is a great choice for a handheld shower head and the bronze finish will complement any bathroom decor. This AquaDance shower head has antimicrobial and anti-clog spray nozzles to prevent mold and mineral buildup. The flexible rubber design of the spray nozzles allows you to clean the nozzles and remove any buildup. This helps keep your shower head clean while continuing to provide maximum water flow. 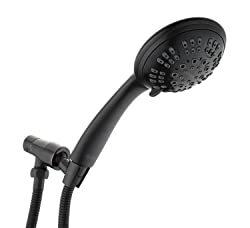 This product includes a 4-inch diameter handheld shower head with an ergonomic hand grip. You can hold this shower head in your hand and use the full 60-inches of the stainless steel hose to rinse off. They include an overhead shower head in this combination kit. It has a 7-inch diameter face and offers rainfall type of water spray for great water coverage. Both shower heads have turn dials that offer six different water spray settings. You can use each shower head independently or use them both at the same time. This gives you 30 different water spray combinations to choose from! I really like this Moen product because it has a magnetic docking system for the handheld shower head. Most handheld shower heads have a bracket you must use to insert the shower handle. The magnetic docking system will attach directly to the shower arm. The magnetic dock allows you to use the shower head as an overhead or a handheld shower. When you return the shower head to the magnetic dock, a distinctive snap lets you know the shower head is docked. The face of this shower head is 3.5-inches wide. A turn dial offers you six different water spray pattern choices. Moen uses WaterSense which is a program sponsored by the EPA (Environmental Protection Agency) to improve water efficiency. This shower head reduces water consumption without sacrificing performance. Moen offers a lifetime warranty on this product making it a risk-free option for you to try. The ShowerMaxx Luxury Spa handheld shower head turns your bathroom into a luxurious spa experience. 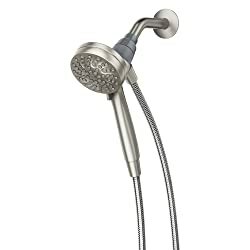 This shower head offers six different water spray settings including a gentle light mist which is great for baby baths. It also has an ECO-friendly water saver trickle intended for use while lathering or shaving. The handheld shower head has a 60-inch flexible stainless steel hose which stretches up to 80-inches. This is great for elderly individuals or anyone who needs to sit down on the shower or tub to avoid slips and falls. A mesh filter in the shower head keeps the water flow clean and free of debris. ShowMaxx offers a Peace-Of-Mind lifetime warranty on this product. This is a great risk-free and budget-friendly choice for your handheld shower needs. Handheld shower heads have many features you should consider before you buy one. Depending on your needs, consider one with a longer hose length or one that has a magnetic holder instead of a bracket. We have provided some guidelines below to help you with your buying decision. Most handheld shower heads come with a 60-inch long hose. 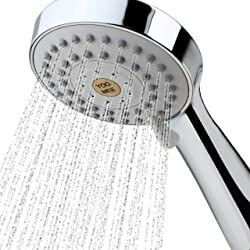 If you have an extra long bathtub or wide shower, consider a handheld shower head that has a longer hose length. You need to make sure that the hose is advertised as a flexible hose. If you want a handheld shower head that has massaging features, make sure you review the details on the water spray features. Most handheld shower heads come with several spray settings. Be sure that at least one setting is a massage spray function. When using a handheld shower head, the last thing you want is to drop it on your toes! Be sure that the handle has some type of rubber covering or is designed ergonomically for better grip and control. 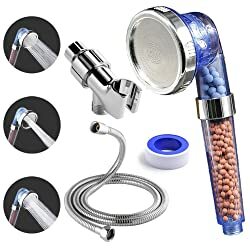 As you can see there are many features available when you are looking for a handheld shower head. After reading our product reviews and feature guidelines we provided, you now have the information needed to make an informed decision. 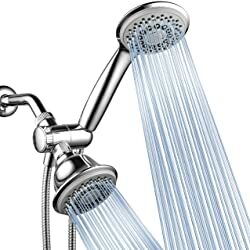 Before you buy a shower head, remember to read the product reviews.